Hello Linux Geeksters. As you may know, Tor Browser Bundle is an internet browser based on Mozilla Firefox configured to protect the users’ anonimity, via Tor and Vidalia. The bundle also includes 3 Firefox extensions: Torbutton, NoScript and HTTPS-Everywhere. 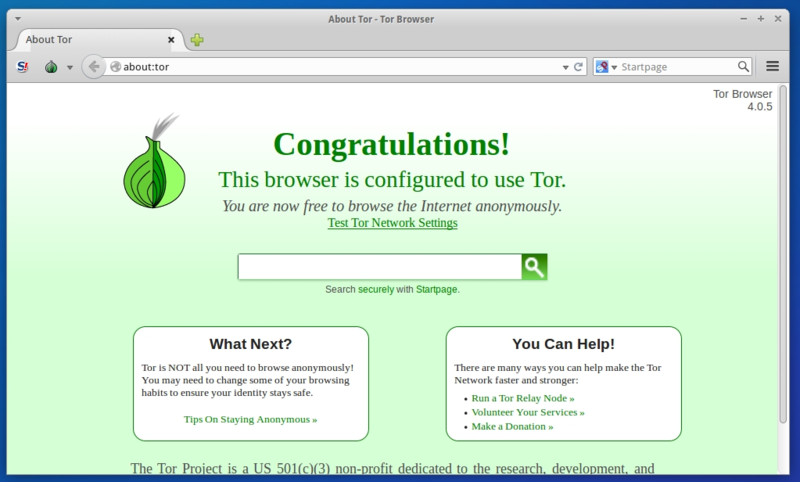 The Tor Browser anonymizes the traffic and encrypts everything everything in the Tor network. Via the HTTPS-Everywhere extension, it also encrypts the traffic between the Tor network and the final destination. For more information about this release, see the official changelog. In this article I will show you how to install Tor Browser 4.0.5 on Ubuntu, Linux Mint, Elementary OS, Pinguy OS, LXLE, Deepin, Linux Lite, Peppermint, Debian, Kwheezy, SparkyLinux, Fedora, CentOS, OpenSUSE, Mageia, OpenMandriva, Arch Linux and Manjaro. Because Tor Browser Bundle 4.0.5 is not available via any repository yet, we have to download Tor from the project’s site, extract the archive, move to /opt and alias the launcher. To start tor, just open a terminal, type tor and hit enter. Next, to use Tor, open it, press connect and wait until you get connected to the Tor network.